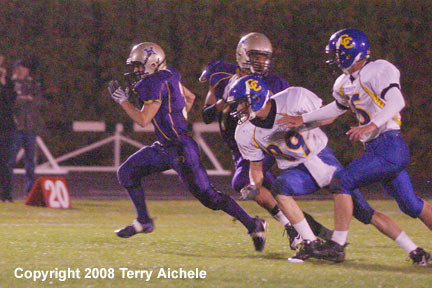 The Hermiston Bulldogs driving to one of their scores in the first half of Friday's game with Crook County. The game was played in a steady drizzle and the southwest stadium lights went out during halftime. The Hermiston Bulldogs lead the IMC with a 3-0 conference record. The Dawgs overall record is 3-2. Crook County is 0-2 in the IMC conference and 2-4 overall. 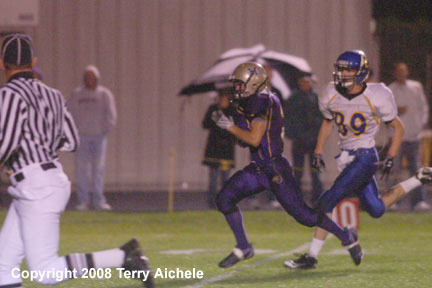 HERMISTON - Hermiston defeated the Crook County Cowboys 35-20 on Friday night. 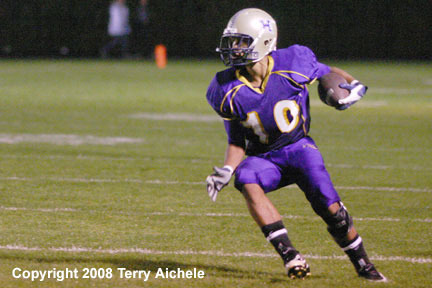 Hermiston used more of a running game to set up the pass against the Cowboys. It was a night that had a constant drizzle that increased during the first half. As the game wore on the rain caused players to slip and the ball to become slick. During the halftime show a clicking or popping sound was heard coming from the southwest stadium lights. A few moments later those lights went out. Crook County took the opening kickoff and were forced to punt on 4th and 11. Hermiston took the ball on their own 33 yard line. Tyler Green anchored the Dawgs drive with four runs. Hermiston quarterback Faafiaula Ena connected with passes Johnny Kayembe and Cody Humphrey. The Dawgs were on the Cowboys two yard line with a second and goal when Ena handed off to Green for the first score. Luis Ortiz continued to be one of the best kickers in recent memory with the first of five successful extra points to give Hermiston the 7-0 lead. 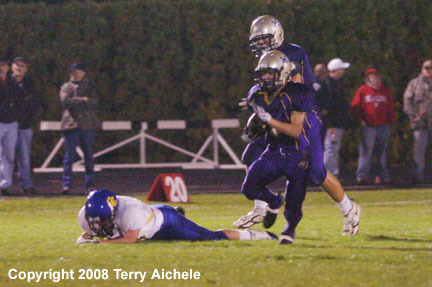 The Cowboys fumbled to the Dawgs on the Hermiston 37 yard line. Ena handed off to Tyler Green who then ran 63 yards down the far sideline for a touchdown. The Ortiz extra point gave the Dawgs a 14-0 lead with 1:02 to go in the first quarter. The teams exchanged possessions. Hermiston received a punt with 4:00 to go in the first half. The Dawgs were able to move the ball with a mix of runs and passing. Ena connected with Kayembe on a 20 yard pass completion. With 2:43 to go Hermiston was on the Cowboys seven yardline. Ena handed off to Green for the touchdown. 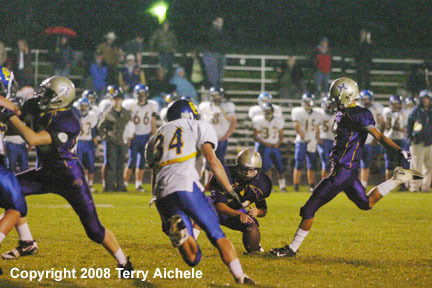 The Ortiz extra point was good and Hermiston had a 21=0 lead. With a 1:34 to go in the half the Cowboys tried a pass from punt formation on 4th and 10 on their own 37 yard line. 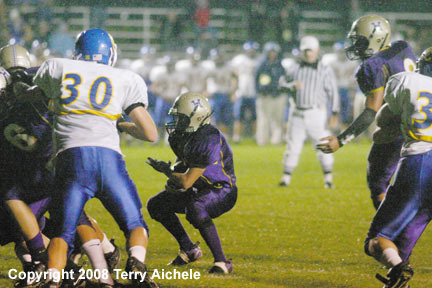 The pass was incomplete and Hermiston took possession of the ball. Hermiston went to Ben Wood for several runs. On fourth and goal Ena kept the ball and ran up the middle for a touchdown. 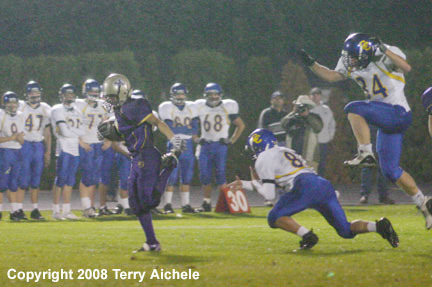 The extra point was good giving Hermiston the 28-0 lead with 14 seconds left in the first half. 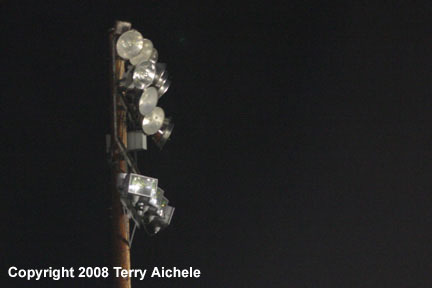 The teams returned to a darker field at the start of the second half because the southwest stadium lights had gone out. Hermiston's Ben Wood took the kickoff on a 70 yard touchdown run. 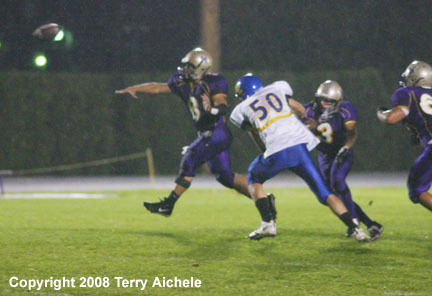 With the extra point Hermiston had a 35-0 lead. The Cowboys took the ensuing kickoff and drove down the field into the darkness of the west end of the field. On a second and goal on the four yardline the Cowboys scored on a run. A bad snap kept the Cowboys from making the extra point but they were on the board 35-6. There were no scoring opportunities until the fourth quarter. The Cowboys were sitting second and goal on the Bulldog ten yard line. The Cowboys called a draw with quarterback Zach Lea handing off to Rodney Leasy for a touchdown run at 9:19 to go in the game. The extra point was no good which gave the Dawgs a 35-12 lead. With 1:35 to go in the game the Cowboys were at the Hermiston 37 yardline. Lea handed off to Mark Flegel, who hadn't made much of mark in the game up to this point, who ran it in for a touchdown. The two point conversion was good and that made the final score 35-20. The Mountain View won with a final score of 7-1. LEFT - Tyler Green of Hermiston runs early in the first quarter. RIGHT - Tyler Green of Hermiston runs 63 yards for a touchdown to give the Dawgs a 14-0 lead. 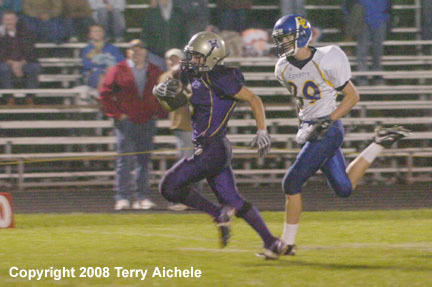 LEFT - Another photo of Tyler Green's big run for a touchdown in the first quarter. RIGHT - Hermiston's Johnny Kayembe cuts to the right after running down the sideline following a pass reception. LEFT - Hermiston quarterback Faafiaula Ena lets fly with a pass during the game on Friday night. RIGHT - Tyler Green of Hermiston looks for an opening in the line following the handoff from Faafiaula Ena. LEFT - Luis Ortiz kicked a perfect five for five extra points on Friday. 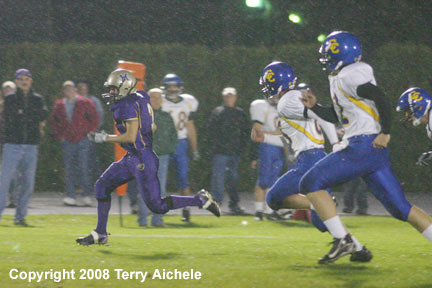 RIGHT - Hermiston's Tyler Green on a run in the drizzle on Friday night. LEFT - Green leaves two Cowboys in the dust on one of his runs. RIGHT - Green on another run. 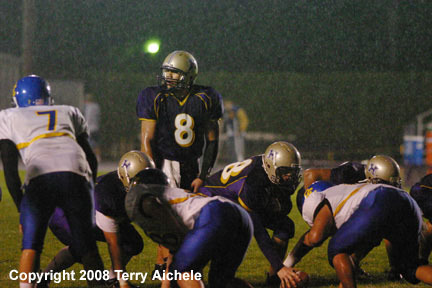 LEFT - Hermiston's Faafiaula Ena comes up to the line as Hermiston drives for another touchdown in the rain Friday night. RIGHT - The southwest stadium lights that went dark during halftime.